In 1966, the Dr. Seuss-penned children’s book How the Grinch Stole Christmas! was adapted into a half-hour television special which later became a holiday classic. 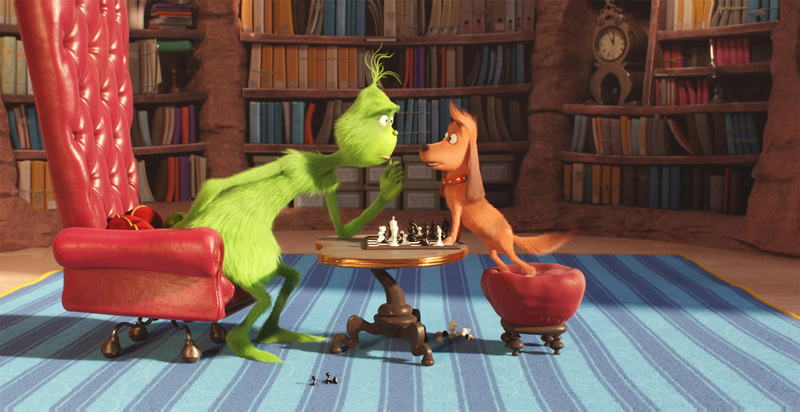 For thirty-four years, it was a staple of holiday programming (and still is) and the only adaptation of the book until a live-action feature-length version of the film starring Jim Carrey divided audiences in the year 2000. One would have thought they’d have left such a classic alone after the live-action experiment, but being as how it made nearly triple its budget, it couldn’t be ruled out that we’d see the Grinch again someday in the future. Today is that day. 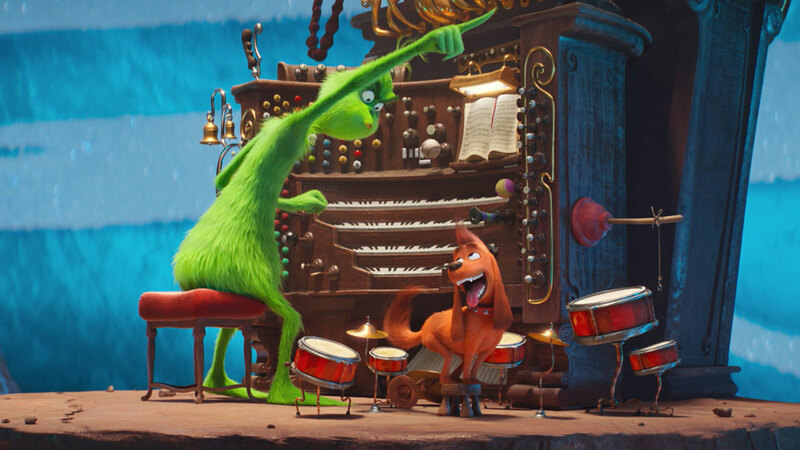 The Grinch is co-directed by Yarrow Cheney (The Secret Life of Pets) and first-time director Scott Mosier, whose name you may recognize as a friend of director Kevin Smith’s and producer of a large number of Smith’s films. 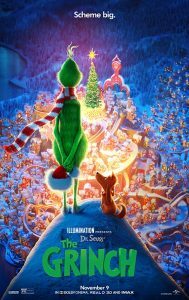 The film stars Benedict Cumberbatch as the voice of the titular character and follows him through the same Grinch story that we’re all familiar with already. For those who don’t know the story, the Grinch lives in solitude in a cave above Whoville and absolutely despises Christmas and all the joyous wonder it brings to the inhabitants of the town. After he’s had enough, he decides he’s going to steal Christmas from them by dressing as Santa Claus, sliding in and out of the houses of Whoville and steal every bit of Christmas joy he can. 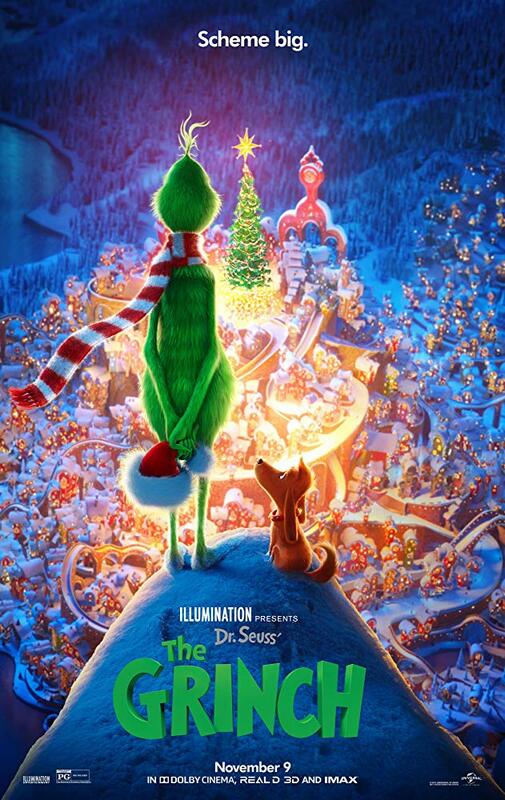 There is a subplot this time around focusing more on Cindy Lou Who (Cameron Seely, The Greatest Showman), an adorable little girl who’s on a mission to seek out and/or capture Santa and ask for one special thing for Christmas. While cute, it felt to me more just like filler to lengthen this once thirty-minute television special into a feature-length film. The same applies to Cindy Lou’s mother, Donna Lou (Rashida Jones), who’s being overworked and doing everything she can to provide for her three kids. The voice work in the film isn’t bad. Cumberbatch does his best to give life to this rendition of the Grinch character, but he’s no Boris Karloff. Neither is Pharrell Williams, who’s providing the narration throughout the film. Kenan Thompson’s jovial Bricklebaum is entertaining in nearly every appearance and a brief cameo of Angela Lansbury should bring some smiles to those who are familiar with her voice. The film is brought to you by Illumination Entertainment, the studio responsible for tormenting us with the nearly intolerable minions from the Despicable Me franchise. The animation was pretty crisp and colorful and should hold the attention of the younger audience with ease. In fact, there were several scenes that stood out as shots made specifically to be seen in 3D and I thought it might have been cool to see them in that format for that little extra pizzazz. The most notable blemish on the film, however, is the music. A new rendition of the holiday classic “Mr. 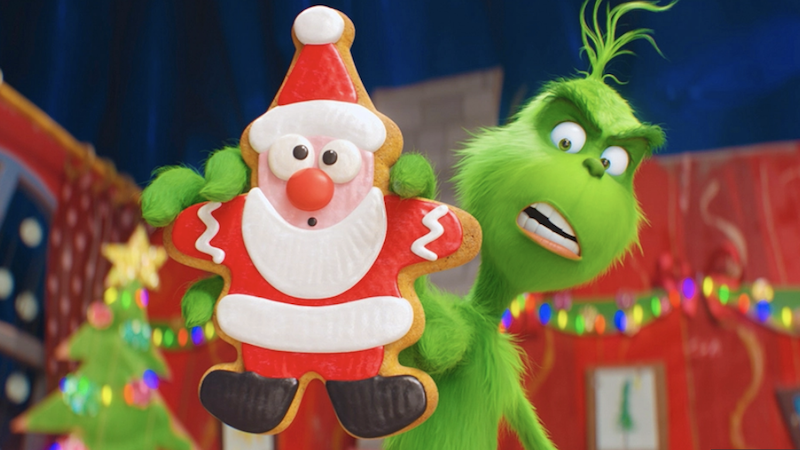 Grinch” is performed by Tyler the Creator early on within The Grinch, and it sticks out like a sore thumb, not pairing with the festive and colorful animation presented on the screen. In the end, I think The Grinch is a recognizable enough character to rake in quite a bit of cash for the next couple weeks as we get more and more into the holiday season. The families at my screening seemed to have a good enough time with it, and I too found myself laughing at a few spots as well. When it comes down to it though, it’s just a distant cousin to the 1966 special that inspired it. Or maybe I’m just a Grinch myself.